Ultralight, small and easy on the wallet too? No thinking necessary with this versatile package that includes the feather-light, precision-simmering Crux Lite stove and the Terra Solo Cook Set now with a non-stick coating for fast cleanup on your fast-and-light adventures. You can escape the urban jungle with a super light rucksack and still sup like a prince with this 272g system. Ultralight, small and easy on the wallet too? No thinking necessary with this versatile package that includes the feather-light, precision-simmering Crux Lite stove and the Terra Solo Cook Set now with a non-stick coating for fast cleanup on your fast-and-light adventures. You can escape the urban jungle with a super light rucksack and still sup like a prince with this 272g system. The tidy little bundle holds a pot with pour spot and a tough-as-nails fry pan (that doubles as a pot lid). Keep it neat in the mesh carry bag. Inside that, magically find room to also stash our folding spork and a 100g gas cartridge too. Choose your tools: the stove, the cook set, or take it all when you escape the daily grind. 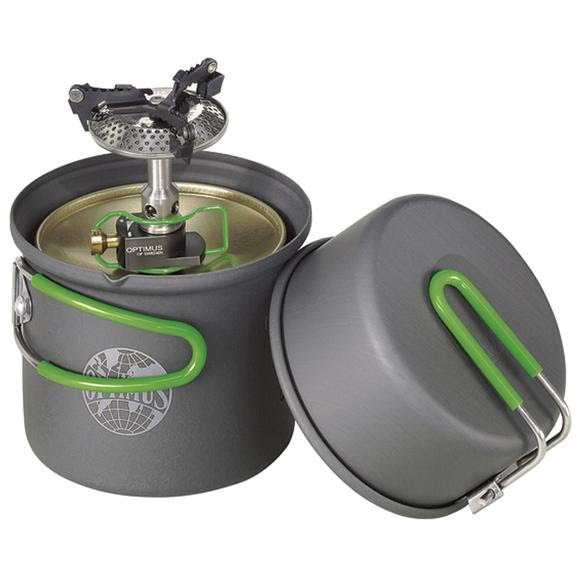 System Includes: Crux Lite stove, 0.6 L (hard anodized aluminum) non-stick coated saucepan with pouring lid and measuring marks (mL and oz), fry pan that doubles as a lid, mesh storage bag and nylon storage bag to store Crux Lite stove, user manual.